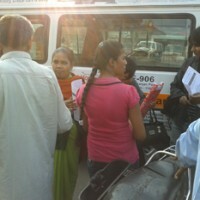 SAANS , a global foundation is working with different health and social sectors like FICCI, USAIDS, TERI, National Heart Institute, MAX Hospital, New Delhi, SAMA Hospital ,Cleveland Clinic Foundation, Primary Physicians forum, WHO, Pharmaceuticals to raise the bar of health care delivery system in Respiratory, Critical Care, Life style and breathing disorders in sleep. SAANS foundation’s philosophy is early detection, treatment and root cause evaluation . SAANS is catering to all kinds of respiratory, lifestyle, critical care and sleep disordered breathing through grass root awareness. 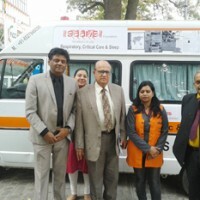 Our dedicated community outreach van equipped with modern and advocacy facilities named SARTHAK community is regularly involved in community outreach activities. SAANS care is a state of art centre equipped with modern diagnostic, audiovisual and treatment units. The centre is managed by Pulmonologist, Dr Bose, social workers, lung educators, lab technicians, physiotherapists, sleep technicians, radiographers and relation managers. 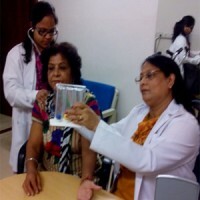 Each patient is subjected to a detailed patient education session and subjected to specific treatment protocols. SAANS care is incomplete without a one to one rehab program because all chronic diseases need a systematic rehab protocols. Thanks to our team of Masters of physiotherapy (MPTS) who are catering to these patients though our SAMARTH Rehab centre. SAANS believes gateway to total fitness is journey from physical, mental, emotional, environment and social to spiritual wellness in nutshell, a total wellness experience. Old age is a huge responsibility for the society. SAANS takes proactive initiate to cater to old patients through its Home care services named SAHAJ Home care. A 24X7 patient care services at homes. We provide free counseling, subsidized drug, disposable and diagnostic facilities with optimum treatment at home. Our trained health workers named SAKSHAM, a multitasking motivated youngsters involve in health care services. SAKSHAM, a capacity building in health sector by nurturing talent in unemployed youth is an innovative initiative by SAANS. These trained health workers are working as a bridging gap as Allied Health professionals in different health care delivery system.